Our mission is to inspire a compassionate, healthy and earth-friendly way for all beings to live together and to share our rescue farm with vulnerable people in our community so that they can experience a healing connection to others, to nature and to themselves. In 2006, after purchasing a 13-acre dairy farm in Columbus, Wisconsin, vegan co-founders Deborah and Carl Schwink opened their doors to a trailer full of recently rescued sheep from Pennsylvania. 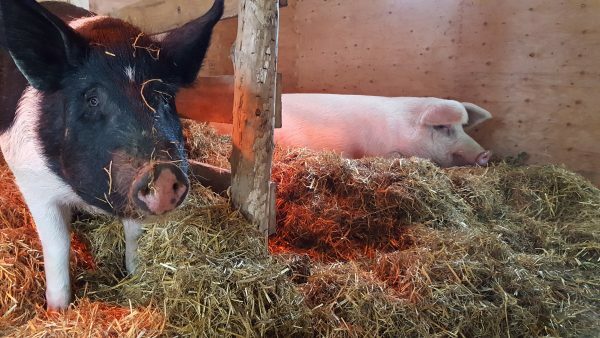 The “Sweet Potato Farm Animal Sanctuary” was born and after a change in employment, the Schwinks relocated with all of the animals to the east coast in 2013. Today the sanctuary (now called Graze in Peace) is located in Durham, Maine. a world in which the intrinsic individuality of each human and nonhuman being on this planet is recognized, and a world in which there is no cause to treat one with any less compassion or respect than the other.